Zoned Decimal and packed Decimal (COMP- 3) fields. How Does COMP 3 saves storage space? Two computer codes which are used for internal representation of data are EBCDIC and ASCII. 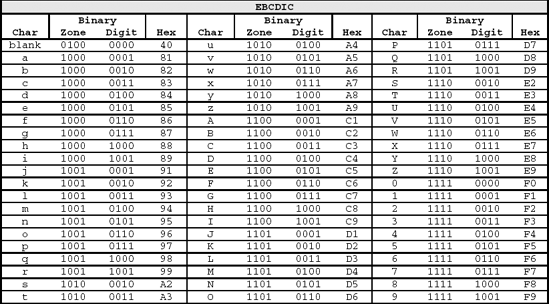 Extended Binary coded decimal interchange(EBCDIC) code is a 8 bit character encoding standard used in IBM environment. Most of the other Non IBM machines use ASCII standard. Below is the EBCDIC representation of the alphabets and numbers followed in IBM environment. Following the chart, we can see 'a' (2nd row in above chart) is represented in binary in 1000000001 and has the hex value of 81. All characters & numbers are represented in 8 bits. These 8 bits can be broken into two 4 bit segments. For historical reasons, the high order 4 bits are called zone part and low order 4 bits are called digits part. Each of these 4 bits are represented by one hexadecimal character. 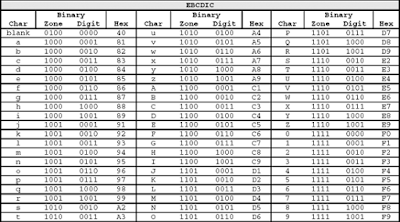 Thus each 8 bit EBCDIC can be represented by two character hexadecimal value. The high order 4 bits are used to represent whether the value stored is a letter,positive or negative number. Low order 4 bits represents numbers 0-9. Thus we see that in zoned decimal each byte represents one digit. So, how will the positive number 62587 be stored in the system? In zoned decimal, the zone portion of the rightmost byte represents the sign of the number. For positive number, the zone portion is always 1111. For negative number the zone portion becomes 1101. Packed Decimal fields: How does it save spaces? Let's see how it works. In packed decimal format, the zone portion is stripped from each byte, so that two digits can be packed together in one byte.This way the space for zone portion of each byte can be used to represent another digit. Thus two digits are represented in single byte there by saving the space. Only the zone portion of the low order or the rightmost byte is kept for storing the sign of the field. Considering the same example, see how the number 62587 will be stored in packed decimal format. Space utilized will be reduced from 5 bytes to 3 bytes. We can see that two digits are packed in single byte by stripping of the zone portion of all the bytes except the last byte (marked in brown). Had it been a negative number the last byte would have contained 1101 in place of 1111. This way, a packed decimal number saves space by packing two digits in one byte. COALESCE function in DB2 . Alternative to NULL indicator variable in DB2 ; SQLCODE - 305. If a table column is not defined with NOT NULL, then it implies that the column value can be NULL sometimes. For such columns,if we do not use null handling technique, then the application program will give sqlcode -305. To avoid that we use indicator variables.However , we can also use the DB2 COALESCE function. COALESCE is a function that allows you to substitute any numeric or character value for a null, based on the column data type. Suppose in DEPT table, i have one column for optional subject(optsubj). It can have a value of 'Y'or 'N'. However since the column is not defined with NOT NULL keyword,it can fetch null values. If we simply use the query below, our application program will return sqlcode -305. This function can be used in many ways to get desired results. For understanding RENT compiler option, we need to know what is a re-entrant program. A re-entrant is a program that doesn’t change itself. “How can a program change itself?” Does the word "Multi threading " looks familiar? Reentrant and mutithreading are related but somewhat different topics. 1. Program code – the instructions that are executed when a program runs. 2. Constants – constants used in a program. These are set when the program is written, and never change. 3.Working Storage area – or variables. This area changes when different user fires the same program. "A reentrant Cobol program gives each user their own copy of working storage. " used by subsystems such as CICS or IMS or whatever to support reentrant programs. For each user the copy of the working storage is dynamically acquired and initialized from the original copy. When a user interacts with the program , he only modifies his copy of the variables. When the program is interrupted to give another user a turn to use the program, information about the data area associated with that user is saved. So, what will happen if we write a CICS program as non-renetrant? When one transaction waits, a second transaction can come and modify the working storage variables, and thus providing unstable or undesirable results. Thus, Re-entrant programs allow a single copy of a program or routine to be used concurrently by two or more processes. For cobol, we use the compiler option RENT to generate reentrant object program. We want to bind it and run the program. But we are not sure about the package and plan details.So where do we find it from? SYSIBM tables will give us the details we need.Lets check it out. With the program name we can query SYSIBM.SYSPACKAGE table giving the name of the program(PGM-ABC) against the column 'NAME'. We can use DB2 file-aid tool or use the below query in SPUFI. From experience, we should try to select the latest rows from the tables checking the TIMESTAMP fields; or check what other ppl have used in recent times. 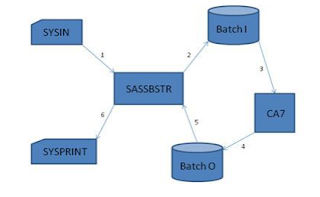 This post is all about connecting DB2 from SAS in mainframe environment and using the result set for further processing. To call and connect to DB2 session we need the SQL proc to be called first using the statement PROC SQL. When used in a program we need to begin the code with PROC SQL and end it with QUIT; In Between these two we can write our SQL codes to fetch the required data. Without wasting much time lets check the first JCL used to connect to db2. CREATE TABLE test AS <== test is the sas datset here. JCL is self explanatory. %PUT SQLXRC and SQLMSG are the macros used to capture the DB2 return codes and error messages if any. Now, lets have the JCL to execute the CA7 from batch terminal. All relevant information for the particular job SJABCD7 will be listed in SYSOUT since we gave SYSPRINT DD SYSOUT=*. Check the commonly used CA7 commands in this page. We can use these commands in the SYSIN DD* statements. UCC7CMDS DD statement is a communication dataset which is used to read the CA7 commands from SYSIN DD Statements into the input dataset. The CA7 commands are embedded within the SYSIN DD statement.All valid commands can be used here. Usually the programs are written in a cataloged procedure and the batch terminal is given as an input to the program. The output can be stored in a dataset.